An Alaska Small Estate Affidavit is a legal device used to distribute assets that belonged to a Decedent in a summary distribution manner to survivors without full probate administration. When someone in Alaska dies and the size of the estate is less than $15,000, the estate may qualify for a simplified process for administering small estates. This process requires much less documentation and time. This procedure involves the use of an Alaska Small Estate Affidavit. An Alaska Small Estate Affidavit is a sworn statement signed under oath by an heir or heirs of an estate attesting that the estate’s value is worth less than $15,000. The Alaska Affidavit of Small Estate is extremely useful when heirs need quick access to the deceased’s bank accounts and securities. Click here to start a free, customizable Alaska Small Estate Affidavit. The Alaska Small Estate Affidavit should be prepared by the executor of the deceased’s will or the person with the most knowledge of the deceased’s assets. If the Decedent dies without a will, then the spouse and heirs must prepare the Alaska Affidavit of Small Estate. Thirty days have passed since the death of the decedent. Confirmation that the deceased is a former resident of the county in Alaska. The Alaska Small Estate Affidavit is used to inform a probate court that a particular estate meets the requirements of Alaska Small Estate laws. Alaska caps the value of a small estate at $15,000 in assets. An Alaska Small Estate Affidavit is filed in the Alaska Superior Court where the Decedent lived at the time of death. It can also be filed in any county in Alaska where the Decedent owned property. The Alaska Affidavit of Small Estate informs the Court of the value of the deceased’s assets. Once the Alaska Affidavit of Small Estate is filed, the Court issues an order approving the Affidavit and transferring the property to the heirs. 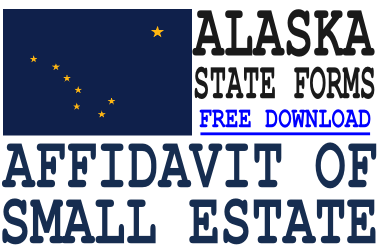 Click here to start a free Alaska Small Estate Affidavit.